Josh Chigwangwa: UHURU KENYATTA NARROWLY WINS KENYA'S POLLS: ARE THERE ANY LESSONS LEARNT FOR ZIMBABWE ? UHURU KENYATTA NARROWLY WINS KENYA'S POLLS: ARE THERE ANY LESSONS LEARNT FOR ZIMBABWE ? 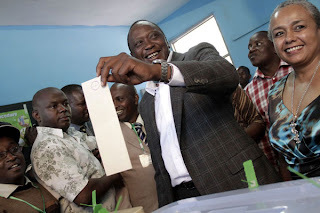 Uhuru Kenyatta (51) won Kenya;s electoral polls by narrowly beating his rival Raila Odinga (68). 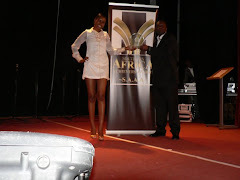 Kenyatta garnered 6,173,433 (50.07%) compared to main rival Raila's 5,340,546 (43,3%). Kenya, with an estimated population of 32 million people has 14, 352,533 registered voters of which 12,330,028 cast their votes representing an impressive 86% voter turnout, which represents about 38,5% of the overall population. Uhuru has since been confirmed as President Elect for Kenya despite protestations from Raila who queried the electoral process before and during the count. The process surprisingly witnessed peaceful protests in stark contrast to horrific incidences of ethnic violence which marred the previous elections which culminated in a transitional government. Poll Observers and the EU have endorsed the polls as a success and peaceful. US Secretary of State John Kerry has since hailed the Kenyan people for conducting a peaceful poll. Lessons emerging from the Kenyan election appears to indicate that the Kenyan people have shown a high degree of voter awareness and responsiveness to exercising their right to vote with a record 86% voter turnout. In Zimbabwe's instance for the 2008 elections, the estimated population then was 12,754,378 with about 5,5m registered voters. 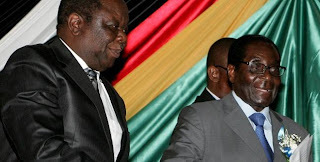 In the 2008 March elections, Tsvangirai polled 1,195,562 votes against Mugabe's 1,079,730 while in the June elections, Tsvangirai got a paltry 233 000 votes compared to Mugabe's 2,150,269 votes. This accounted for about 41,4% of the registered voters which represented approximately 18,7% of the overall population. It is critical to encourage more people to register as voters and to intensify voter education so that more people exercise their right to vote on Polling Day. The ability to attract large crowds at campaign rallies will not necessarily translate to an electoral landslide victory and may instead instil a complacency and a false sense of popularity. 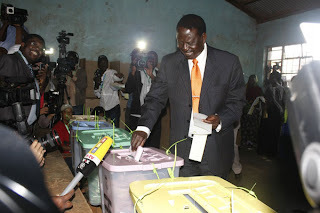 Raila Odinga casting his ballot. What maybe also be emerging is that perhaps it may be "unafrican" to concede defeat or let alone congratulate the winning candidate, a prerequisite for respecting the will of the people. Despite endorsements of a peaceful electoral outcome, losing rival Raila Odinga refused to concede defeat and has vowed to contest the results through the courts claiming electoral fraud and irregularities. The Kenyan people however, appear determined to avoid a repeat of the violent aftermath of the disputed 2007 elections, which claimed the lives of more 1200 people through ethnic violence that spread across the country. The ability to absorb pressure from party supporters in the face of defeat is the other lesson. Raila Odinga’s victory starved supporters in the Nairobi slums of Kibera and Mathare had expressed bitterness, declaring lack of confidence in Kenyan authorities including the Electoral Commission. Odinga however urged his supporters to refrain from taking to the streets and instead opting to pursue the matter via the courts. The aftermath of pressure emerging from pledges with external players as electoral underwriters and perceived manipulation and influence from the West. Raila's strong links with the West may have also made him pay dearly in the electoral polls. Raila Odinga, popularly known to Kenyans as Agwambo, the son of the first Vice President of Kenya, Jaramogi Odinga is believed to be a first cousin of US President Barrack Obama, through Obama's father. The lesson is perhaps to have the ability to assess the degree of sensitivity arising from links with the US and other EU countries. There is also an emerging tradition of taking "as personal spite", results of an electoral outcome including the tendency of assuming this result as an outright rejection by the people rather than appreciate that one's ideologies or electoral strategy is the direct cause of one's failure to gain trust and reliability from the electorate. Kenya has also evolved a new leaf and chapter of less violent polls in the history of its politics and this is an opportunity for its political leaders to be selfless and seek to unite its people. The Kenyan people collectively and regardless of political or ethnic persuasion should come first and this juncture should see the entire nation embracing each other as one. This also puts demands on Uhuru to put aside differences and honour political pledges that the Kenyan people are yearning for. Uhuru needs to extend a gesture to Raila and accord him due respect as an alternative political voice that will bring checks and balances to the new govt!! Its no longer a contest but an obligation to value the electoral pledges and transform the lives of the Kenyan people to economic prosperity, peace and better standards of living. As Zimbabweans, there is a lesson learnt on the benefits of seeing through an electoral process free of violence and political intimidation and how this translates to a smooth process of peace and tranquility. After all, its only an electoral process which is an event, valuing our lives and relationships as a nation united by common links as a sovereign nation is paramount as opposed to giving preference to our political persuasions and gravity of external influence. The focus has now shifted towards cash-strapped Zimbabwe tasked with the undaunting challenge of holding the Constitution referendum on March 16, followed by the parliamentary and presidential polls thereafter. The process is hinged on the sanctions debacle, lack of resources to fund the exercises and political banter. The run-up to the referendum has been calmer due to consensus from the main rival parties, ZPF and MDC-T, for a "Yes" vote to approve the proposed draft constitution. There has been incidences of police high handedness to reign in civil society groups and isolated reports of unsubstantiated politically motivated violence, a characteristic of anticipated events in the run up to elections due to tempers fanned by heights of political tension.